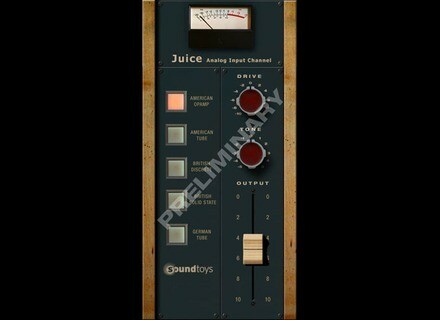 Juice, Other Effect Plug-in from Soundtoys. Soundtoys created a new tool designed for "the subtler side of analog" - Juice, their upcoming analog input channel modeling plug-in. "We learned so much developing the modeling technology that’s in Decapitator, and plan to take it even further with Juice. We’ve also collected a ridiculous amount of rare and high-end analog input channels here in the lab, and need to put those to good use. Our plan for Juice is to develop 4 to 6 entirely new input models based on console input channels and/or mic pres, running at normal to slightly driven levels (just the preamp part, not the EQ… yet.) And with this one we’re going to hold our destructive urges in check (sorry, no punish button!) to give you just the right amount of sweet juicy goodness for all of your tracks. We’ll have more to say soon, but here’s a look at the first draft of the interface for Juice." Check out toybox.soundtoys.com/toybox for more. FXpansion City of Drums and Beats for GURU FXpansion presents City of Drums and Beats, a GURU expansion pack featuring a suite of sounds from Mike Acosta, a.k.a. DJ Michael Trance. Loopmasters Audio Injection Vol. 2 Audio Injection is back with another 24 Bit sample pack for your sample library. Loopmasters Indian Sessions Vol. 2 Loopmasters have teamed up with Indian percussionist KV Bala Krishnan to put together this collection of Indian percussion, Indian vocals and Sitar samples.